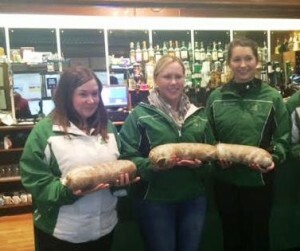 Haggis low road winners are….Team Ireland! Well done to the Irish girls at the Haggis at Greenacres at the weekend winning the Low Road final against Adrian Meikle 8-3. Haz had vamos’d it by that stage. The team were Alison Fyfe, Ailsa Anderson, Jen Ward and Hazel Gormley-Leahy. Martin Sutherland stood in for Hazel for the semi and final as Hazel had to catch her flight back to Spain. Ailsa will give us a report of the on ice action shortly. Well done girls!! Future of the ICA looks very bright indeed.